CARLA's series of annual Immersion Research-to-Action Briefs provides a readily digestible means of keeping educators informed about ongoing research in the field of language immersion education that has implications for their daily practice. How Can Learner Language Inform Mandarin Immersion Teaching? 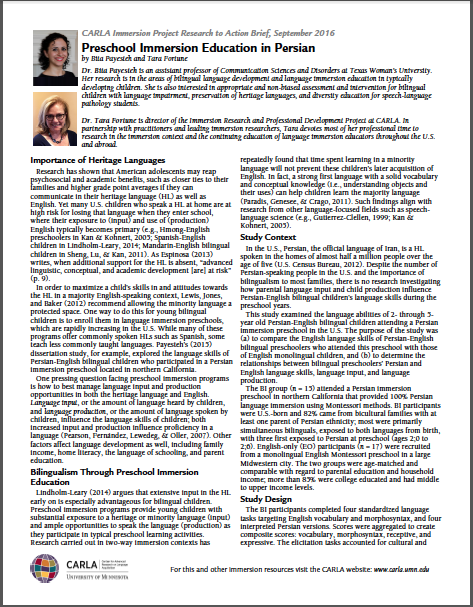 Dr. Tara Fortune and CARLA research assistant, Zhongkui Ju, discuss key findings from a multi-year research project examining the oral proficiency outcomes of Mandarin immersion learners in the U.S. 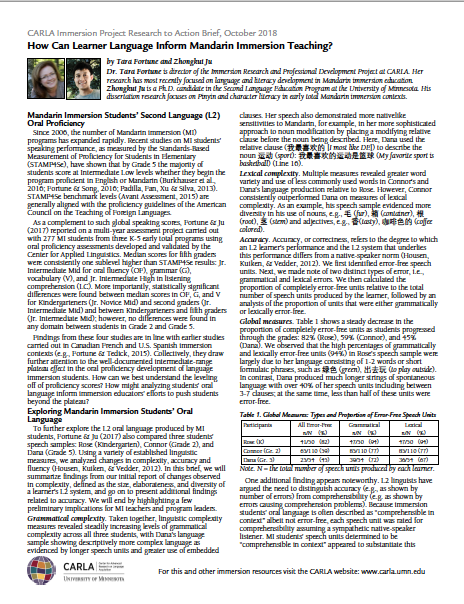 Results from their exploratory linguistic analysis of students' speech samples highlight specific aspects of learner language that can benefit from instructional interventions known to be effective in immersion classrooms. Secondary Immersion Teaching and Learning: What Role do Classroom Materials Play? Doctoral student Corinne Mathieu shares her research study fundings on immersion teacher use of classroom materials in a seventh-grade social studies context. The study shows that materials and the type of thinking skills teachers engaged had an important impact on both the quantity and quality of student language production. 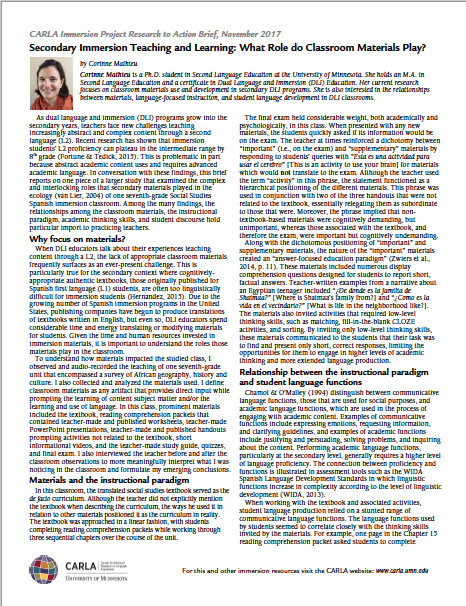 Dr. Bita Payestech and Dr. Tara Fortune highlight findings of Payestah's research on heritage language learners in an immersion preschool indicating that 100% Persian-medium education was not detrimental to children's English language development. 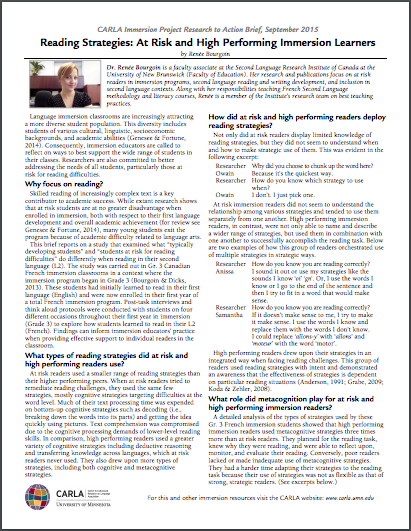 For the inaugural Brief, Dr. Renée Bourgoin (University of New Brunswick, Canada) drew upon her dissertation research that investigated at risk and typically developing readers’ use of reading strategies in Gr. 3 French immersion classrooms.